Piglet is now at the age when she is starting to understand cause and effect, along with the emotions that coincide with that. She is able to interact much more with both us, her siblings and the people around her. With toys featuring heavily in her life and are a great way to not only for her to have fun but for her to understand sharing, caring, and self-expression. The Fisher-Price Little People range was a favourite for both Roo and Tigger. With different sets available they allow toddlers and pre-schoolers to explore different themes of play. The Little People Caring for Animals Farm is a great example allowing children to get hands on with a play farm. Learning different animals, the sounds etc. But also for enabling them to understand the needs of the animals and how they can help them. Farmer Jed works very hard to care for all his animals on the Little People Caring for Animals Farm, and he would love some help from your tiny farmer. Sensory: The farm offers tons of sensory-stimulating fun for little ones – from the bright colours. songs & sounds. to the variety of materials for their tiny hands to explore! Curiosity & Wonder: As toddlers discover all the ways to interact with the farm. like pressing the discovery button to hear fun sounds and see the stall doors pop open. they’ll see how their actions can make fun things happen—a great intro to cause & effect! Emotions & Self-Expression: As kids pretend to feed & care for the farm animals. they’re beginning to learn what it feels like to take care of someone else. The farm offers tons of sensory-stimulating fun for little ones—from the bright colours, songs & sounds, to the variety of materials for their tiny hands to explore! 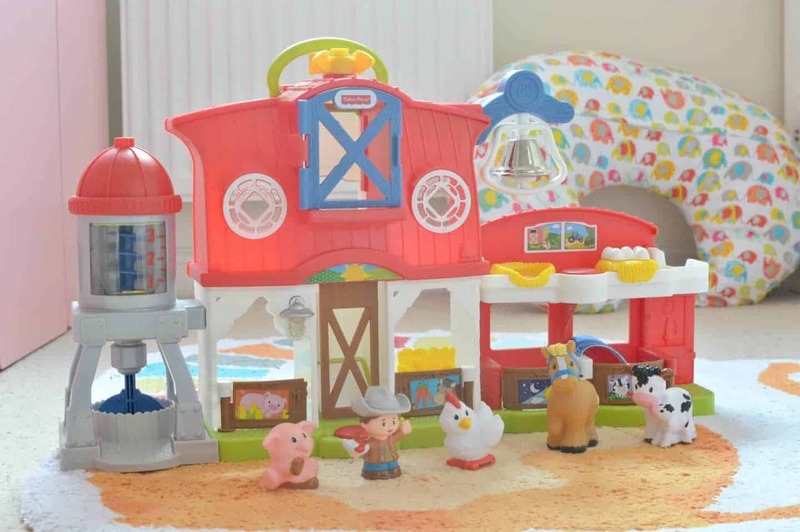 Fisher-Price Little People Caring for Animals Farm // Where can I buy? The Fisher-Price Little People Caring for Animals Farm is priced at £34.99. It is available from Smyths Toys, Amazon, and all other good toy retailers. I really wish I had videoed Piglet’s reaction to seeing the Little People Caring for Animals Farm – it was so sweet to see her excited and grabbing at the animals eager to play. Thankfully unboxing the playset is relatively easy with little assembly required so she was able to get to play straight away. The Little People Caring for Animals Farm is an interactive playset that stimulates toddlers and pre-schoolers on several levels. You have Farmer Jed and the four animal figures – these were a hit from the start, which little one doesn’t love a new little figure to hold, explore and carry around with them? There are the moveable features on the playset, from ringing the bell to let the animal know it is dinner time to turning the silo to make the corn pop. Why not try pressing the discovery button to make the eggs hatch again and again. With doors and gates that open to allow the animals to rest in the barn – with pictures on the front of the door to help them put the correct animal in the correct space. Not forgetting the fun songs, animal sounds and phrases. These really bring the playset to life and along with encouraging the child to copy the sounds. They offer instructions and prompts on how they can help care for the animals. 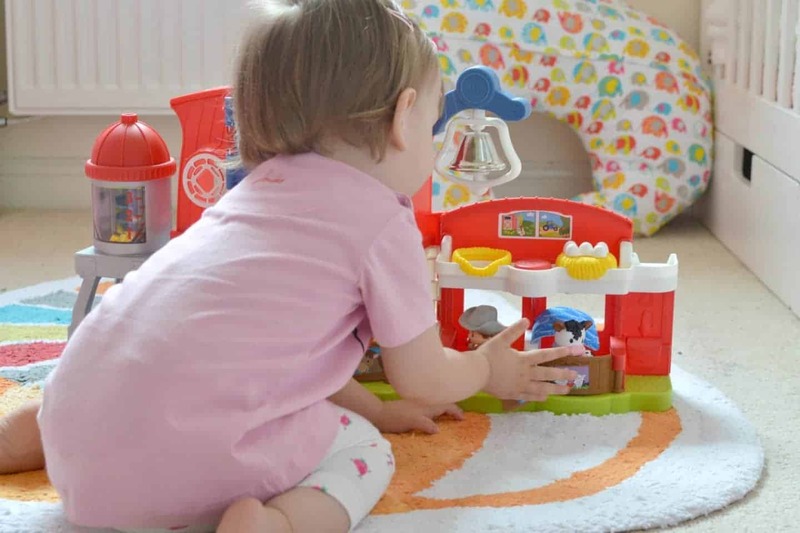 Overall, it is a fun-filled playset that offers much more than just animals on a play farm. Its interactive features have captured Piglet who loves to cover the cover the cow with the blanket or bring corn to the chicken etc.